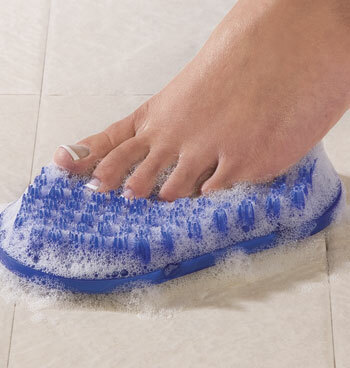 Just pour soap on Soapy Toes™ foot scrubber, step on, and wiggle your feet. The cleaning fingers gently clean and massage while suction cups grip the shower or tub floor. Soft rubber. 7 1/4" x 4 1/4" x 1 1/4". Sold individually. I was introduced to a foot scrubber at my sister's house in California. When I got home to Arizona I kept thinking that I needed to buy one. I found Soapy Toes on the As We Change web site. The great thing about Soapy Toes is that you don't have to use the same brush you clean your body with on your feet. It sits on the floor of your shower. You can scrub your feet good without even bending slightly. All you need to do is squirt a smidge of soap or body wash on your Soapy Toes washer and move your feet back and forth. I love it and from now on will use a Soapy Toes to complete a good scrub in my bath time. I like what this device does for my feet-- it gets them nice and clean and helps keep cracked heels away. However, it does not stick to the bottom of my shower at all. The suction cups are very small and somewhat stiff. I have an acrylic, one-piece shower with a textured bottom, which I'm sure contributes to the problem. I have tried standing on the end of the device with the other foot, but it does not work well. I think I am going to have to try another brand. I would still recommend this to a friend as long as they had a smooth-bottomed tub or shower. Product made well, however I've had trouble getting it to adhere to my shower floor. Maybe because floor is man made marble and not tile. I still use it. I am getting this because I have nervous leg syndrome and hoping this will help when I am traveling. saw a Dr Ox show that said washing your feet is very important. Its hard for me to reach my toes. Because it's hard for me to wash my feet. Easy way to clean feet while showering. Have difficulty bending at my age and I am hoping that this foot scrubber will help me. Im a person of size this will help me in the shower cleaning my feet. My hubby has problems bending so I purchased this for him. Easy without bending to wash feet. It is what I need according to the reviews,except for the fact that it will not stick to my shower floor since it is pebbly. I have one myself and I love how my feet and toes feel, so I am buying this one for mt daughter. While recovering from hip surgery, the Soapy Toes provided an easy way to get feet clean without bending over. Great idea! A friend identified it as a must have. Love the one I have--but it's wearing out after 5 or 6 years. My husband is a diabetic and needs to make sure he has clean feet. My 85 yr, old sister cannot reach her toes. Looks like an easy way to get the feet really clean.